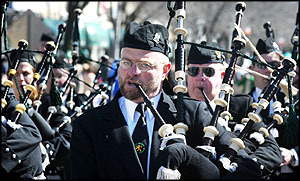 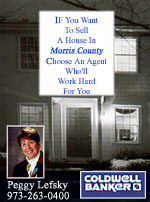 Morristown - Morris County's annual Saint Patrick's Day Parade was held Saturday March 13, 2004. 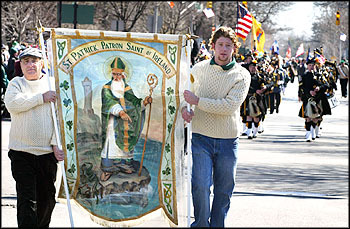 (above) Arthur Crist and his son Patrick, of Succassunna march holding a banner of Saint Patrick. 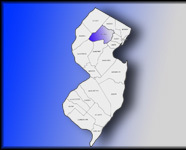 They are with the Irish/American organization of North Jersey. 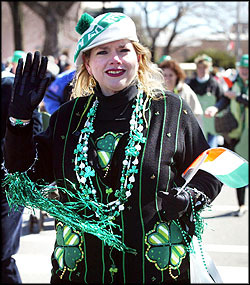 (left) Dolly Mabin, marches with the Morristown Memorial Hospital group. 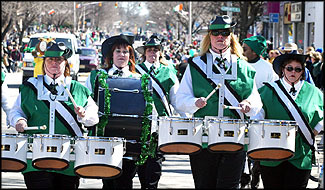 (left) The Emerald GrenaDears Alumni Corps, sponsored by Dover-Rockaway Elks #782. 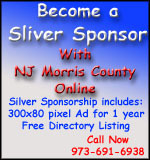 (above right) The Rory C Moore Pipes & Drums band of Morris County. 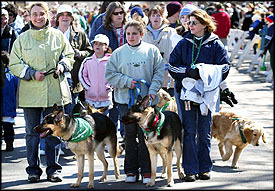 (below left) Members of The Seeing Eye, with their trained guide dogs. 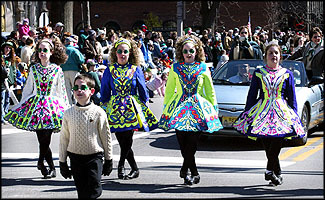 (below right) Members of the Peter J. Smith School of Irish dancing.